Map of Sussex County highlighting Sussex Borough. 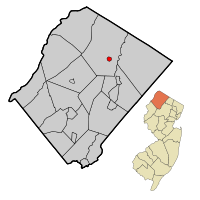 Inset: Location of Sussex County in the State of New Jersey. Sussex is a borough in Sussex County, New Jersey, United States. As of the 2010 United States Census, the borough's population was 2,130, reflecting a decline of 15 (-0.7%) from the 2,145 counted in the 2000 Census, which had in turn declined by 56 (-2.5%) from the 2,201 counted in the 1990 Census. Sussex was incorporated as a borough by an act of the New Jersey Legislature on October 14, 1891, as Deckertown, from portions of Wantage Township. The borough's original name was for settler Peter Decker. The borough was renamed Sussex on March 2, 1902. The county and borough are named for the historic county of Sussex in England. A joint commission of residents of both Sussex and Wantage had recommended that the two communities should be consolidated to form what would be called the Township of Sussex-Wantage, which would operate within the Faulkner Act under the council-manager form of government, with a mayor and a six-member township council, and that voters in both municipalities should approve a referendum to be held on November 3, 2009. The committee noted that the two municipalities share common issues, schools, library and community services and that the artificial nature of the octagonal Sussex border often made it hard to distinguish between the two. The efforts at consolidation with surrounding Wantage Township ended in November 2009 after Wantage voters rejected the merger despite support from Sussex borough residents. According to the United States Census Bureau, the borough had a total area of 0.619 square miles (1.604 km2), including 0.589 square miles (1.526 km2) of land and 0.030 square miles (0.078 km2) of water (4.86%). It is approximately 400 to 450 feet (120 to 140 m) above sea level. The borough is completely surrounded by Wantage Township, making it part of 21 pairs of "doughnut towns" in the state, where one municipality entirely surrounds another. The borough is in the watershed of the Wallkill River (which flows north, and empties into the Rondout Creek, which flows into the Hudson River near Kingston, New York) and its tributary Glen Brook, which near Sussex forms a small body of water called Clove Lake, part of which is within the borough. Due to its inland location and elevation, Sussex has a climate much cooler than most of the state, classified as humid continental (Köppen Dfb), with cold, moderately snowy winters, and very warm, humid summers. It is part of USDA Plant Hardiness Zone 6. The monthly daily average temperature ranges from 25.0 °F (−3.9 °C) in January to 71.1 °F (21.7 °C) in July. Temperatures reach 90 °F (32 °C) on 12.6 days and fall to 0 °F (−18 °C) on 6 nights annually. Snowfall averages 42 inches (107 cm) per season, although this usually varies widely from year to year. Extremes in temperature range from −29 °F (−34 °C) on January 21, 1994 up to 106 °F (41 °C) on July 10, 1936. As of the 2010 United States Census, there were 2,130 people, 899 households, and 525.016 families residing in the borough. The population density was 3,615.9 per square mile (1,396.1/km2). There were 1,005 housing units at an average density of 1,706.1 per square mile (658.7/km2). The racial makeup of the borough was 91.03% (1,939) White, 1.92% (41) Black or African American, 0.33% (7) Native American, 2.30% (49) Asian, 0.42% (9) Pacific Islander, 1.36% (29) from other races, and 2.63% (56) from two or more races. Hispanic or Latino of any race were 7.93% (169) of the population. There were 899 households out of which 26.8% had children under the age of 18 living with them, 36.8% were married couples living together, 15.5% had a female householder with no husband present, and 41.6% were non-families. 36.9% of all households were made up of individuals, and 12.8% had someone living alone who was 65 years of age or older. The average household size was 2.32 and the average family size was 3.04. In the borough, the population was spread out with 22.8% under the age of 18, 9.6% from 18 to 24, 27.3% from 25 to 44, 28.1% from 45 to 64, and 12.3% who were 65 years of age or older. The median age was 38.7 years. For every 100 females there were 100.9 males. For every 100 females ages 18 and older there were 98.2 males. The Census Bureau's 2006-2010 American Community Survey showed that (in 2010 inflation-adjusted dollars) median household income was $40,978 (with a margin of error of +/- $13,975) and the median family income was $53,125 (+/- $10,034). Males had a median income of $40,234 (+/- $9,777) versus $30,777 (+/- $3,942) for females. The per capita income for the borough was $20,887 (+/- $2,314). About 13.0% of families and 15.1% of the population were below the poverty line, including 22.4% of those under age 18 and 12.0% of those age 65 or over. As of the 2000 United States Census there were 2,145 people, 903 households, and 512 families residing in the borough. The population density was 3,598 people per square mile (1,380/km2). There were 961 housing units at an average density of 1,612/sq mi (618/km2). The racial makeup of the borough was 96.32% White, 1.12% African American, 0.09% Native American, 1.21% Asian, 0.37% from other races, and 0.89% from two or more races. Hispanic or Latino of any race were 2.56% of the population. There were 903 households out of which 28.3% had children under the age of 18 living with them, 38.9% were married couples living together, 12.6% had a female householder with no husband present, and 43.2% were non-families. 35.1% of all households were made up of individuals and 12.6% had someone living alone who was 65 years of age or older. The average household size was 2.36 and the average family size was 3.12. In the borough the population was spread out with 23.9% under the age of 18, 8.5% from 18 to 24, 32.9% from 25 to 44, 22.0% from 45 to 64, and 12.7% who were 65 years of age or older. The median age was 36 years. For every 100 females, there were 91.5 males. For every 100 females age 18 and over, there were 91.8 males. The median income for a household in the borough was $36,172, and the median income for a family was $45,250. Males had a median income of $37,009 versus $22,475 for females. The per capita income for the borough was $18,866. About 6.9% of families and 11.0% of the population were below the poverty line, including 15.6% of those under age 18 and 8.4% of those age 65 or over. Sussex is governed under the Borough form of New Jersey municipal government. The governing body consists of a Mayor and a Borough Council comprising six council members, with all positions elected at-large on a partisan basis as part of the November general election. A Mayor is elected directly by the voters to a four-year term of office. The Borough Council consists of six members elected to serve three-year terms on a staggered basis, with two seats coming up for election each year in a three-year cycle. The Borough form of government used by Sussex, the most common system used in the state, is a "weak mayor / strong council" government in which council members act as the legislative body with the mayor presiding at meetings and voting only in the event of a tie. The mayor can veto ordinances subject to an override by a two-thirds majority vote of the council. The mayor makes committee and liaison assignments for council members, and most appointments are made by the mayor with the advice and consent of the council. As of 2016[update], the Mayor of Sussex Borough is Democrat Katherine A. Little, whose term of office ends on December 31, 2019. Members of the Borough Council are Council President Robert Holowach (R, 2017), Albert Decker (D, 2017; appointed to serve an unexpired term until November 2016), Franklin Dykstra (R, 2016; elected to serve an unexpired term), Linda A. Masson (R, 2018), Edward J. Meyer (R, 2018) and Georgeanna R. Stoll (R, 2016). In January 2016, the council appointed Albert Decker from a list three candidates nominated by the Democratic municipal committee to fill the council seat vacated by Katherine Little expiring in December 2017 that became open when she took office as mayor; Decker will serve on an interim basis until the November 2016 general election, when voters will select a candidate to serve the one year remaining on the term of office. In January 2015, the Borough Council selected Mario Poggi from three candidates nominated by the Republican municipal committee to fill the vacant seat of Bruce D. LaBar, who resigned from office earlier that month. In the November 2015 general election, Frank Dykstra was chosen to fill the balance of the seat expiring in December 2016. Sussex Borough is located in the 5th Congressional District and is part of New Jersey's 24th state legislative district. As of March 23, 2011, there were a total of 1,143 registered voters in Sussex, of which 193 (16.9% vs. 16.5% countywide) were registered as Democrats, 428 (37.4% vs. 39.3%) were registered as Republicans and 521 (45.6% vs. 44.1%) were registered as Unaffiliated. There was one voter registered to another party. Among the borough's 2010 Census population, 53.7% (vs. 65.8% in Sussex County) were registered to vote, including 69.5% of those ages 18 and over (vs. 86.5% countywide). In the 2012 presidential election, Republican Mitt Romney received 391 votes (57.8% vs. 59.4% countywide), ahead of Democrat Barack Obama with 270 votes (39.9% vs. 38.2%) and other candidates with 16 votes (2.4% vs. 2.1%), among the 677 ballots cast by the borough's 1,146 registered voters, for a turnout of 59.1% (vs. 68.3% in Sussex County). In the 2008 presidential election, Republican John McCain received 427 votes (57.1% vs. 59.2% countywide), ahead of Democrat Barack Obama with 299 votes (40.0% vs. 38.7%) and other candidates with 18 votes (2.4% vs. 1.5%), among the 748 ballots cast by the borough's 1,109 registered voters, for a turnout of 67.4% (vs. 76.9% in Sussex County). In the 2004 presidential election, Republican George W. Bush received 456 votes (62.0% vs. 63.9% countywide), ahead of Democrat John Kerry with 263 votes (35.7% vs. 34.4%) and other candidates with 16 votes (2.2% vs. 1.3%), among the 736 ballots cast by the borough's 1,091 registered voters, for a turnout of 67.5% (vs. 77.7% in the whole county). In the 2013 gubernatorial election, Republican Chris Christie received 70.8% of the vote (276 cast), ahead of Democrat Barbara Buono with 25.4% (99 votes), and other candidates with 3.8% (15 votes), among the 397 ballots cast by the borough's 1,148 registered voters (7 ballots were spoiled), for a turnout of 34.6%. In the 2009 gubernatorial election, Republican Chris Christie received 291 votes (56.8% vs. 63.3% countywide), ahead of Democrat Jon Corzine with 140 votes (27.3% vs. 25.7%), Independent Chris Daggett with 59 votes (11.5% vs. 9.1%) and other candidates with 16 votes (3.1% vs. 1.3%), among the 512 ballots cast by the borough's 1,109 registered voters, yielding a 46.2% turnout (vs. 52.3% in the county). Students in public school for kindergarten through eighth grade attend the Sussex-Wantage Regional School District, together with students from Wantage Township. As of the 2014-15 school year, the district and its three schools had an enrollment of 1,806 students and 110.8 classroom teachers (on an FTE basis), for a student–teacher ratio of 16.3:1. Schools in the district (with 2014-15 enrollment data from the National Center for Education Statistics) are Clifton E. Lawrence School in Wantage (377 students; grades K - 2), Wantage Elementary School in Sussex (358; 3 - 5) and Sussex Middle School in Sussex (412; 6 - 8). For ninth through twelfth grades, public school students attend High Point Regional High School, together with students from Branchville, Frankford Township, Lafayette Township, Montague Township and Wantage Township (where the school is located). As of the 2015-16 school year, the high school had an enrollment of 981 students and 91.1 classroom teachers (on an FTE basis), for a student–teacher ratio of 10.8:1. Sussex Christian School is an inter-denominational Christian private day school that was founded in 1958 by members of the Sussex Christian Reformed Church, and which serves students from Northern New Jersey and the surrounding communities in New York and Pennsylvania. As of May 2010[update], the borough had a total of 9.21 miles (14.82 km) of roadways, of which 6.67 miles (10.73 km) were maintained by the municipality, 0.87 miles (1.40 km) by Sussex County and 1.67 miles (2.69 km) by the New Jersey Department of Transportation. Sussex is located at the intersection of Route 23 and Route 284. Local bus service is provided by the Skylands Connect bus, which provides service to Hamburg, Sparta, and Newton. Sussex Airport is located 1 mile (1.6 km) southwest of Sussex. See also: Category:People from Sussex, New Jersey. D. C. Fontana (born 1939), television script writer and story editor, best known for her work on the original Star Trek franchise and several western television series. Bill Glynn (1925-2013), Major League Baseball first baseman who played four seasons of professional baseball for the Cleveland Indians and the Philadelphia Phillies. William Alexander Linn (1846-1917), journalist and historian. ^ a b Mayor and Council, Sussex Borough. Accessed August 2, 2016. ^ Municipal Clerk / Administrator, Borough of Sussex. Accessed August 2, 2016. ^ U.S. Geological Survey Geographic Names Information System: Borough of Sussex, Geographic Names Information System. Accessed March 14, 2013. ^ a b c d e f DP-1 - Profile of General Population and Housing Characteristics: 2010 for Sussex borough, Sussex County, New Jersey, United States Census Bureau. Accessed April 2, 2012. ^ a b c Table DP-1. Profile of General Demographic Characteristics: 2010 for Sussex borough, New Jersey Department of Labor and Workforce Development. Accessed April 4, 2012. ^ a b GCT-PH1 Population, Housing Units, Area, and Density: 2010 - State -- County Subdivision from the 2010 Census Summary File 1 for New Jersey, United States Census Bureau. Accessed February 26, 2013. ^ Look Up a ZIP Code for Sussex, NJ, United States Postal Service. Accessed April 4, 2012. ^ Area Code Lookup - NPA NXX for Sussex, NJ, Area-Codes.com. Accessed August 30, 2013. ^ Table 7. Population for the Counties and Municipalities in New Jersey: 1990, 2000 and 2010 Archived May 20, 2013, at the Wayback Machine, New Jersey Department of Labor and Workforce Development, February 2011. Accessed February 26, 2013. ^ a b Snyder, John P. The Story of New Jersey's Civil Boundaries: 1606-1968, Bureau of Geology and Topography; Trenton, New Jersey; 1969. pp. 229 and 232. Accessed April 2, 2012. ^ History of Sussex Boro - Sussex County, New Jersey, NY-NJ-CT Botany Online. Accessed October 11, 2015. "The village was known as Deckertown in honor of early settler Peter Decker." ^ Hutchinson, Viola L. The Origin of New Jersey Place Names, New Jersey Public Library Commission, May 1945. Accessed October 11, 2015. ^ Gannett, Henry. The Origin of Certain Place Names in the United States, p. 294. United States Government Printing Office, 1905. Accessed October 11, 2015. ^ Borough of Sussex and Township of Wantage: Joint Municipal Consolidation Study Commission Report. Wantage Township, New Jersey. Accessed April 4, 2012. ^ Donohue, Brian. "Sussex, Wantage reject merger; home rule still rules in New Jersey", The Star-Ledger, November 13, 2009. Accessed April 4, 2012. "That's just what happened last week in the Township of Wantage, where voters rejected a ballot measure that would have joined the town with the tiny Borough of Sussex. Sussex is essentially Wantage's downtown, cut off from the surrounding township in a feud over utilities costs in the late 1800's. Sussex voters were largely for the reunion." ^ What is my arborday.org Hardiness Zone?, Arbor Day Foundation. Accessed March 31, 2013. ^ NowData - NOAA Online Weather Data, National Oceanic and Atmospheric Administration. Accessed March 4, 2012. ^ Thirteenth Census of the United States, 1910: Population by Counties and Minor Civil Divisions, 1910, 1900, 1890, United States Census Bureau, p. 338. Accessed February 25, 2013. ^ Fifteenth Census of the United States : 1930 - Population Volume I, United States Census Bureau, p. 719. Accessed April 4, 2012. ^ a b c d e Census 2000 Profiles of Demographic / Social / Economic / Housing Characteristics for Sussex borough, New Jersey, United States Census Bureau. Accessed February 26, 2013. ^ a b c d e DP-1: Profile of General Demographic Characteristics: 2000 - Census 2000 Summary File 1 (SF 1) 100-Percent Data for Sussex borough, Sussex County, New Jersey, United States Census Bureau. Accessed February 26, 2013. ^ DP03: Selected Economic Characteristics from the 2006-2010 American Community Survey 5-Year Estimates for Sussex borough, Sussex County, New Jersey, United States Census Bureau. Accessed April 4, 2012. ^ Cerra, Michael F. "Forms of Government: Everything You've Always Wanted to Know, But Were Afraid to Ask" Archived September 24, 2014, at the Wayback Machine, New Jersey State League of Municipalities. Accessed November 30, 2014. ^ 2016 Municipal Data Sheet, Sussex Borough. Accessed August 2, 2016. ^ a b Sussex County General Election November 3, 2015 Summary Report Official Results, Sussex County, New Jersey Clerk, updated November 6, 2015. Accessed August 1, 2016. ^ Sussex County General and School Election November 5, 2013 Summary Report Official Results, Sussex County, New Jersey Clerk, updated November 7, 2013. Accessed August 1, 2016. ^ Olinski, Vera. "New council members take seats; Residents question temporary mayor's 2015 vetoes", The Advertiser News, January 18, 2016. Accessed May 5, 2016. "Municipal Clerk Mark Zschack administered the Oath of Office Jan. 5 at the Sussex Borough Council reorganization meeting to three Council members, and on Jan. 19, the council appointed Albert Decker to take the place of newly elected mayor Katherine Little on the council." ^ Staff. "Sussex installs new councilman", The Advertiser News, January 21, 2015. Accessed April 15, 2015. "On the heels of Councilman Bruce LaBar's resignation Jan. 7, the Sussex Borough Council unanimously selected Mario Poggi to take LaBar's place on Tuesday. Poggi will serve the remainder of LaBar's 2015 Sussex Borough Council term." ^ 2017 New Jersey Citizen's Guide to Government Archived April 7, 2017, at the Wayback Machine, p. 64, New Jersey League of Women Voters. Accessed May 30, 2017. ^ a b Voter Registration Summary - Sussex, New Jersey Department of State Division of Elections, March 23, 2011. Accessed February 26, 2013. ^ GCT-P7: Selected Age Groups: 2010 - State -- County Subdivision; 2010 Census Summary File 1 for New Jersey, United States Census Bureau. Accessed February 26, 2013. ^ General Election November 6, 2012: District Report - Group Detail Archived June 6, 2013, at the Wayback Machine, Sussex County, New Jersey Clerk, run date November 30, 2012. Accessed February 26, 2013. ^ 2008 Presidential General Election Results: Sussex County, New Jersey Department of State Division of Elections, December 23, 2008. Accessed February 26, 2013. ^ 2004 Presidential Election: Sussex County, New Jersey Department of State Division of Elections, December 13, 2004. Accessed February 26, 2013. ^ 2009 Governor: Sussex County, New Jersey Department of State Division of Elections, December 31, 2009. Accessed February 26, 2013. ^ District information for Sussex-Wantage Regional School District, National Center for Education Statistics. Accessed December 7, 2016. ^ School Data for the Sussex-Wantage Regional School District, National Center for Education Statistics. Accessed December 7, 2016. ^ Clifton E. Lawrence School Archived June 15, 2013, at Archive.today, Sussex-Wantage Regional School District. Accessed January 4, 2017. ^ Wantage Elementary School Archived June 15, 2013, at Archive.today, Sussex-Wantage Regional School District. Accessed January 4, 2017. ^ Sussex Middle School Archived March 19, 2011, at the Wayback Machine, Sussex-Wantage Regional School District. Accessed January 4, 2017. ^ Schools Archived September 13, 2012, at Archive.today, Sussex-Wantage Regional School District. Accessed January 4, 2017. ^ New Jersey School Directory for the Sussex-Wantage Regional School District, New Jersey Department of Education. Accessed December 29, 2016. ^ "2016-17 School Profile", High Point Regional High School. Accessed March 18, 2018. "Located 63 miles northwest of Manhattan in bucolic Sussex, County NJ, High Point serves students from six municipalities: Branchville, Lafayette, Frankford, Montague, Sussex, and Wantage." ^ School data for High Point Regional High School, National Center for Education Statistics. Accessed February 12, 2018. ^ Our Heritage, Sussex Christian School. Accessed May 19, 2011. ^ Sussex County Mileage by Municipality and Jurisdiction, New Jersey Department of Transportation, May 2010. Accessed July 21, 2014. ^ Skylands Connect, Sussex County. Accessed July 21, 2014. ^ Sussex Airport, AirNav.com. Accessed April 4, 2012. ^ Beckerman, Jim. "Ex-Totowa resident a shaper of Star Trek", The Record (Bergen County), September 8, 2016. Accessed September 12, 2016. "'That was kind of the only way at the time,' says Fontana, who was born in Sussex, moved to Totowa a year later, and lived there for the next 19 years." ^ Marsh, Richard. Bill Glynn, Society for American Baseball Research. Accessed August 11, 2016. "William Vincent Glynn, who played for three seasons with the Indians in a four-year major-league career, was born on June 30, 1925, in Sussex, New Jersey, the second son of Marshall Nelson, a laborer in a zinc mine, and his wife, Esta. A premier athlete at Franklin High School, Glynn lettered as a first baseman in baseball, a running back in football, and a forward in basketball." ^ A Thousand American Men of Mark To-day, p. 260. Accessed November 15, 2017. "WILLIAM ALEXANDER LINN Lawyer, Banker, Author of Hackensack, N.J. was born Sept 4. 1846, in Sussex, N.J"
Wikimedia Commons has media related to Sussex, New Jersey. This page was last edited on 22 January 2019, at 18:33 (UTC).